Frequently recommended to me (especially by my sister and niece), I decided to give this series a try, when book #1 was given away as a free e-book. What a perfect opportunity! I’ll admit, the first quarter of the book didn’t floor me, but it didn’t take much longer than that, and I was swept away into the 1700’s and didn’t want to come back 😉 No vampires, no Weres, no mystical gods in this one, however the time travel mystery that takes Claire Randall away from her home and husband to another time (and another man’s arms *gasp*) was good enough for me! The book begins, in the 1940’s, where the war has ended, and Claire and her husband, Frank Randall, are finally reunited again. Having been married for seven? years, they have spent most of it apart (she was a nurse in the army, and her husband, a soldier) and are now taking the time to get acquainted and start a family. Having relocated to Scotland (they are both originally from England), they are enjoying their time together, in love, and exploring their new home. Frank’s spare time is also spent discovering his heritage, while Claire tries her hand at local botany. Meh…nice. Cute. But big deal, right? We see they are fond of each other (and yes, probably in love). Frank, the polite and scholarly type seems to truly love Claire, and there appears to be passion, but this is not something that I actually “felt”, as their story was recounted. At some point, Claire discovers a “mini” Stonehenge while collecting flowers, and later shares her discovery with Frank. As the two of them return to investigate it, they see a group of jovial elderly women performing a ritual at that very location. Hiding, they quietly spy on them, trying to understand what the women are doing. Could it be a spell of sorts?. Later, Claire goes back, yet again, gets a little too close…and WOOPS!! Bye bye Claire! Thrown back in time, exactly two hundred years, Claire finds herself amongst a mini scuttle between a group of Scottish Highlanders and English soldiers. One of the soldiers (a key character in this book), Jonathan Randall, who looks astonishingly like her own husband, tries to manhandle her (she quickly discovers that he is the very ancestor that has Frank fascinated with his lineage). As things are about to get ugly, she is “saved” by one of the Highlanders and taken away to their clan. Well, more like kidnapped. They are curious about her strange and sudden appearance (without a man, no less). Her odd accent and way of speaking, and of course, that she’s English on Scottish land (and was found with the English that they were scuttling with), and there could be no good in that! She must be a spy! Poor Claire… beyond confused and scared (although she handles herself remarkably well considering the dire circumstances). In a new time, without her husband, and now kidnapped with no way to try and return home, and on top of all that, under suspicion by the very “barbaric” men that have her in their clutches. No friends, no family, no medicine, no way back. As Claire “finds” herself amongst the Scottish clan, she realizes that those around her are not overly hostile. Curious and mostly accepting of her presence, she befriends some of the women, helping them in their tasks, eventually becoming the clan nurse. The Laird and his closest men keep a constant watch over her and question her, but they too, seem to believe that she is not what they first suspected, and attempt to keep her safe. And throughout this, she forges a close, and confiding friendship with Jamie (one of her original, but friendlier, captors). Involuntarily, I reached out, as though I might heal him with a touch and erase the marks with my fingers. He sighed deeply, but didn’t move as I traced the deep scars, one by one, as though to show him the extent of the damage he couldn’t see. I rested my hands on his shoulders in silence, groping for words. He placed his hand over mine, and squeezed lightly in acknowledgment of the things I couldn’t find to say. The clan bachelor (and rumored stud), every women and young girl has hoped to catch his eye, and a few jealous lassies are suddenly giving Claire the “stink-eye”. Watch your back, Claire! All of this, and I was only a quarter of the way through!! But now, the fun begins. So one last thing before I let you loose on this book, because the adventure to be had from here on out, is non-stop. The Laird sends Claire, and his men (including Jamie) off to meet with certain higher-ups from France to determine if her “back-story” is the truth (of course, it’s not…well, not really). I mean, how can she explain, during the time of the witch hunts, that she comes from another time? Who’s gonna believe her? She had to come up with something, and while it is her personal history and heritage, it won’t match THEIR history. I loved this book. I mean…it was one thing happening after another (and not just to her). Jamie will surprise you. Jamie. Jamie was real all right, more real than anything had ever been to me, even Frank and my life in 1945. He wrapped the quilts comfortable around us and lay back beside me. A moment later, he reached again to touch my face. …and then turning right around and internally screaming OH NO HE DIDN’T!!! Claire isn’t always the smartest cookie, either though. I get where she’s coming from, and where she’s trying to go (and yes, she is still trying to get home), but sometimes Claire….I just don’t get your thought process. It’s a different time, and believe me readers, you will both love and hate the 1700’s. I’ll just say, the book is truly exciting, scary, passionate, heart wrenching, WONDERFULLY tumultuous, and just plain…wonderful! I want to go back! And guess what? I get to! 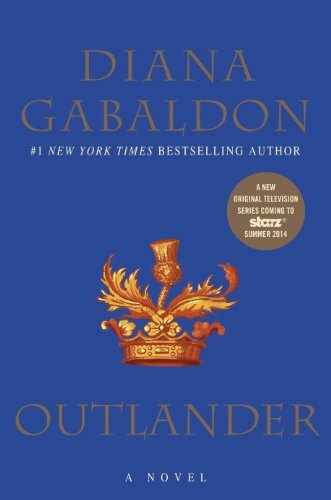 Although I have read the Outlander series several times and have all of them on audiobook, it was a pleasure to read your reviews and remember my confusion. This is such a funny and enjoyable review! This novel was just published in Hungary (where I live) a short while ago and everyone seems to be reading it. I read such positive reviews that I was just starting to get interested – despite the fact that usually I am not really into this historical – romance – time travel – what not genre. Actually, it seems that your review’s just tipped the scales and now I definitely want to give the book a try. Thanks! Thanks for the review. I read this book so many years ago, I was nuts about it and the series. Now with the TV event on, I am catching up again. I have to say I think I quit the series about book 4 – I can’t remember why now! So I just picked up the 1st book again and I am in the 1st quarter of the book! Love, love, love Jamie! If anyone hasn’t seen the TV version please watch it the actor portraying him is spot on in every way he’s what made me pick up the actual book and start reading. I really enjoyed this book Series the relationship between these two characters was amazing.They complimented each others strengths so well and had the same sense of humour (can’t count how many times I laughed out loud). An overall brilliant story that is very well told! I just finished all 8 books in a row and feel so lost and sad that there is not another yet! The most romantic love story ever written, Jamie is a dream! love this series. If I had known you had not read it I would have innidated you with suggestions when I first joined this group. If you ever get into audio books the narrator for this series is fabulous!